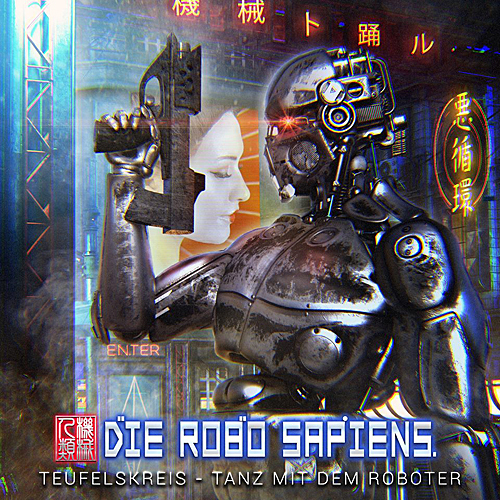 Die Krupps has long been celebrated for blending thrusting EBM and industrial rhythms with the guttural force of heavy metal; now Jürgen Engler and his fellow DK cohorts Ralf Dörper and Marcel Zürcher have announced a new project, Die Robo Sapiens. Taking the name from one of the band’s most recent and biggest hits, “Robo Sapien” from 2013’s The Machinists of Joy, Engler states that “This new band is essentially the ‘all electro’ Die Krupps.” As such, Die Robo Sapiens’ music will feature a more on harder pumping electronic style topped off by lyrics focused on dehumanization and mankind’s dependency on technology. Of the band’s inception, Engler further states, “We always end up with some tracks that are not guitar compatible when writing Die Krupps material, so I decided we needed another outlet for all the electro songs and keep the more metal songs for Die Krupps.” In a special video announcement on Facebook, Engler included a teaser snippet from the first EP, Teufelskreis – Tanz Mit Dem Roboter, which is due for release on Alfa Matrix.